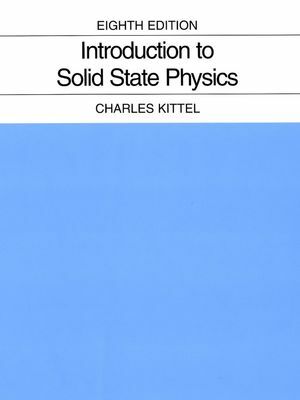 Since the publication of the first edition over 50 years ago, Introduction to Solid State Physics has been the standard solid state physics text for physics majors. The author’s goal from the beginning has been to write a book that is accessible to undergraduate and consistently teachable. The emphasis in the book has always been on physics rather than formal mathematics. With each new edition, the author has attempted to add important new developments in the field without sacrificing the book’s accessibility and teachability. Index System for Crystal Planes. Direct Imaging of Atomic Structure. CHAPTER 2: WAVE DIFFRACTION AND THE RECIPROCAL LATTICE. Diffraction of Waves by Crystals. Fourier Analysis of the Basis. CHAPTER 3: CRYSTAL BINDING AND ELASTIC CONSTANTS. Elastic Compliance and Stiffness Constants. Elastic Waves in Cubic Crystals. CHAPTER 4: PHONONS I. CRYSTAL VIBRATIONS. Vibrations of Crystals with Monatomic Basis. Two Atoms per Primitive Basis. CHAPTER 5: PHONONS II. THERMAL PROPERTIES. CHAPTER 6: FREE ELECTRON FERMI GAS. Energy Levels in One Dimension. Effect of Temperature on the Fermi-Dirac Distribution. Free Electron Gas in Three Dimensions. Heat Capacity of the Electron Gas. Electrical Conductivity and Ohm’s Law. Wave Equation of Electron in a Periodic Potential. Number of Orbitals in a Band. CHAPTER 9: FERMI SURFACES AND METALS. Electron Orbits, Hole Orbits, and Open Orbits. Experimental Methods in Fermi Surface Studies. CHAPTER 11: DIAMAGNETISM AND PARAMAGNETISM. Quantum Theory of Diamagnetism of Mononuclear Systems. Paramagnetic Susceptibility of Conduction Electrons. CHAPTER 12: FERROMAGNETISM AND ANTIFERROMAGNETISM. CHAPTER 14: PLASMONS, POLARITONS, AND POLARONS. Dielectric Function of the Electron Gas. Peierls Instability of Linear Metals. CHAPTER 15: OPTICAL PROCESSES AND EXCITONS. Energy Loss of Fast Particles in a Solid. CHAPTER 16: DIELECTRICS AND FERROELECTRICS. Local Electric Field at an Atom. CHAPTER 17: SURFACE AND INTERFACE PHYSICS. Magnetoresistance in a Two-Dimensional Channel. Electronic Structure of 1D Systems. Electronic Structure of 0D Systems. Vibrational and Thermal Properties of Nanostructures. Low Energy Excitations in Amorphous Solids. Shear Strength of Single Crystals. Substitutional Solid Solutions – Hume-Rotherby Rules. · A very important chapter on nanophysics has been written by an active worker in the field, Professor Paul L. McEuen of Cornell University. This field is the liveliest addition to solid state science during the past ten years. ·The crystallographic notation conforms with current usage in physics. Important equations in the body of the text are repeated in SI and CGS-Gaussian units, where these differ. · The text uses the simplifications made possible by the wide availability of computer technology. Searches using keywords on a search engine (such as Google) easily generate many fresh and useful references.